Thought you’d studied the teams, reviewed their stats, listened to your gut, chose with your heart and got your bracket just right? Think again. Yesterday morning as I turned on CBS for the third day in a row, aligned my bracket next to my opponents and sharpened my pencil to circle the wins – I got to thinking about just what an unpredictable upset March Madness can be in certain years and what the wine industry can learn from the tournament and bracketology. First, studying teams, their history of making it into the tournament, the strength of their program, and the depth of the coaching staff should always be the foundation of your bracket. Most teams have a track record of proven successes or failures. The same goes for vineyard sites and wineries. Some stand out consistently and obviously among competitors, have long standing track records and are the apparent choice. Go ahead, be bold and pen them in. But beware, wild cards and upsets happen. Business plans are derailed, vintages ruined by weather. Neither of which can be predicted by listening to the forecasters and industry experts OR studying farmers almanacs and historical data. Lesson Number 1: When selecting a winery, vineyard site, or grower to work with study the track record of the individual but don’t bet it all on black because the experts and commentators say so. Case in point: Kansas. Second, everyone has to rebuild their program at some point and rebuilding takes long calculated measures and time. It’s called out with the old, in with the new in NCAA coaching and recruiting; it’s called innovation in the wine industry and if you’re not doing it you’re not doing anyone any favors. Vineyards have to be replanted, lead time on selecting a varietal, laying out new trellising on fallow land, planting, tending, harvesting the first year crop takes 5-10 years. You want to rebuild your winemaking team? Pinkslip the old guy, bring in the new guy. ‘Nuff said. Lesson Number 2: The level of burden placed on winegrape growers to rebuild their program, vineyard or relationships, is not only one of Goliath sized proportions, but a long and tedious process that often lasts a lifetime. The lead time decreases drastically on the other side of the court – the wineries; whose business models and structure allow for quick entry and exit of the market, more nimble decision making capabilities and shorter turnaround with overall lessor implications. Balancing these two vested interests takes better understanding of one another on the part of both parties. Case in point: Jim Boeheim has been coaching the Syracuse team for 25+ seasons. You don’t understand the mind of a 19 year old college basketball player and how to truly coach them in just one season. It takes a lifetime of continuous effort and dedication, which eventually leads to greatness and longevity. Since we learned about Kansas in the previous lesson, I’ll go on record as saying Syracuse may just have a shot now at being the NCAA Champion, after all they are being led by a NCAA Coach of the Year. Third, the underdogs are fun. You’ve checked the stats. Brushed up on the program’s history. Maybe selected a wild card to mix things up…maybe not, and you’ve decided to play it safe. Building your winery/grower bracket and selecting the right teams for the right varietals are the very foundation of the business; but don’t get complacent and forget to throw in an underdog. 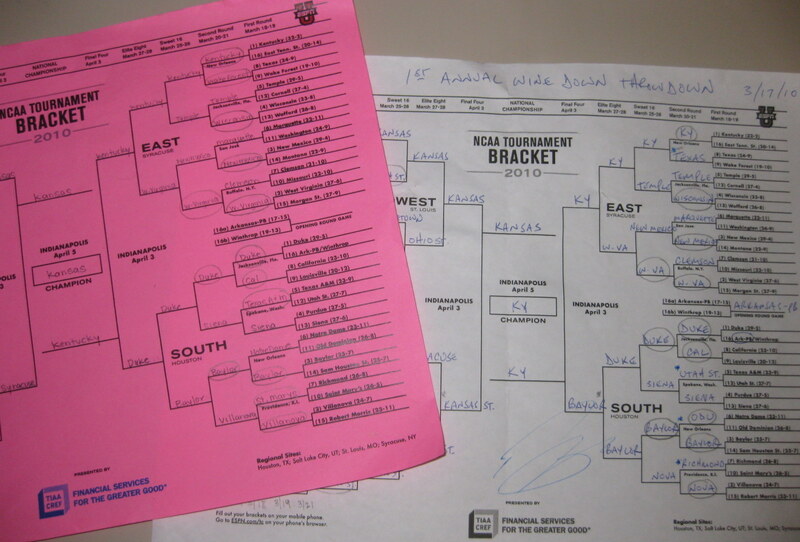 Everyone should be re-working their 2010 bracket right now if they know what’s good for them. Lesson Number 3: Take Lesson Number 1 under advisement, but don’t be afraid to mix it up with a wild card. After all this is supposed to be fun! Case in point: The Gaels and Northern Iowa. Did you see the look on those guys faces when they KOed Kansas? If you aren’t having fun, it’s probably not worth doing. And if you’re in the industry be prepared for upsets. Can’t deal with loss, heartache or the occasional unexpected rebound in double OT? This isn’t the industry for you. The strongest teams have a good mix of repeat performances, relationships with synergy and the ability to acknowledge that sometimes the underdog may just win. Now that the Jayhawks are out, I’m looking for a wild card to win. I think Orange may just be in as the 2010 March Madness Champion!